I was quite disappointed when I first saw that the Samsung Galaxy S8 comes with a single rear-facing camera. I thought that Samsung will follow the dual-lens camera trend and will introduce the S8 with a dual-lens camera. I personally would have preferred a second ultra-wide angle lens so I can shoot ultra wide-angle photos. One of the downsides of having two lenses is that phone manufacturers use smaller sensors because there is either not enough room or having two relatively large sensors would make the phone thicker or more expensive. Smaller sensors tend to have smaller pixels. It depends on the resolution of course, but with a more conservative 12MP resolution, a larger sensor would provide marginally better image quality. That being said, image quality isn't everything. Most people shoot images to share with the friends and save some memories from throughout the day. Many people will be fine with a lesser image quality than the S8 offers. Having a second wide angle lens would like the G6 with its 125-degree wide-angle lens would make all the difference in the world. The lens gives you an image that encompasses more of the surrounding. It also compresses the background less than a lens with a smaller field of view. A wide-angle lens like the one used in the LG G6 can produce some stunning landscape and indoor shots that look much more interesting to view. I was shooting with a DSLR camera for many years, and in many times I preferred changing to a wide-angle lens to get some really unique shots and sometimes I used a normal or a telephoto zoom lens to get close to subjects. The thing is with the Galaxy S8 that you can't change lenses and using a mobile attachable lens is just a burden. Having two lenses is a great way to enjoy both. There is no compromise. You can shoot with every camera you prefer at any given time. The Samsung Galaxy S8 features a rear camera with a 77° field of view. The LG G6 second ultra wide-angle rear camera has a lens with 125° FOV (Field of View). Here is a illustration and image I made to illustrate my point. 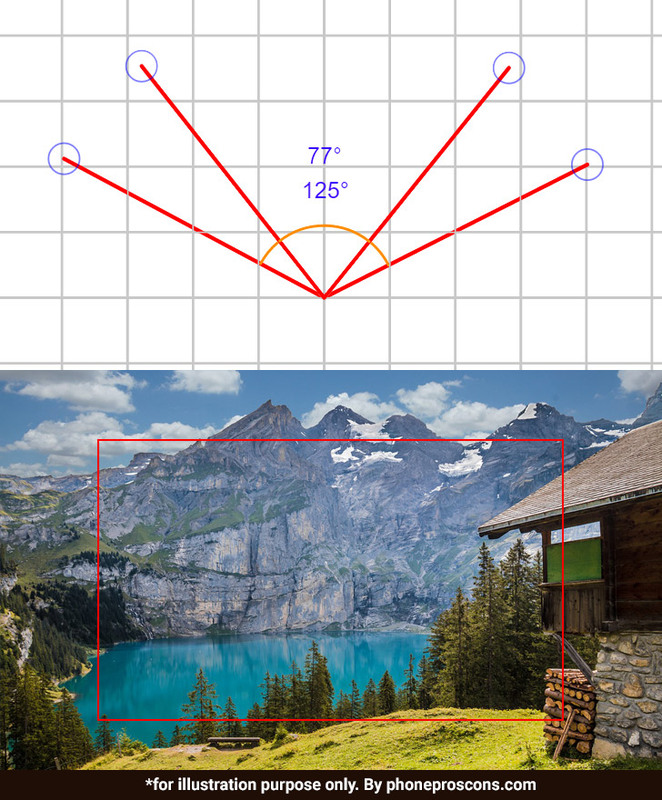 The angle representation is accurate, but the image red rectangle is just for illustration purpose. As you can see, the 125-degree provides a wider field of view, which allows you to capture a shot with more of the surrounding area fitted into the frame. I'm sure that you have been in a situation where you are shooting an a tight indoor area and you need to walk back to get the subject or subjects into the frame or when trying to capture an image of a tall building when shooting it on the ground up close. So with an ultra wide-angle you can do this, whether with a Galaxy S8 lens of the rear camera you are much more limited. This is why I'm disappointed with Samsung's decision to go with a single rear camera and this is one reason I love LG G6 offering better and I can just hope that the Galaxy Note8 will come with a dual-lens camera setup and not a single rear camera like the S8. I think that this is one of the features that makes the LG G6 stand out from the rest and the camera plays a significant role in many buyer's buying decision. I prefer versatility and more creative options than having better image quality and low-light performance. I wish we could have it both. I think it's a unexciting offering from Samsung for its flagship smartphone, but again, it doesn't take away from how good the current S8 camera is, it's still a great camera nevertheless.